At the pub in Hursley on Friday, a white bee landed on the table outside. 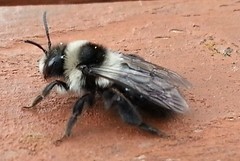 An unusual colour, I think it might be an andrena cineraria, a type of miner bee. Ive never seen one before, but it was quite cool to look at. This entry was posted in Misc and tagged insects, Photography. Bookmark the permalink.